Creating an account on Google, Facebook, and countless other online websites is very easy, in fact now a days almost any second website requires you to create an account at their website in order to use their services. But incase if you decide to delete / deactivate your account, some websites are not so user friendly and won’t have a direct method to do that. It is advised to properly deactivate or delete your online account from any website, once you decide not to use any service from them. 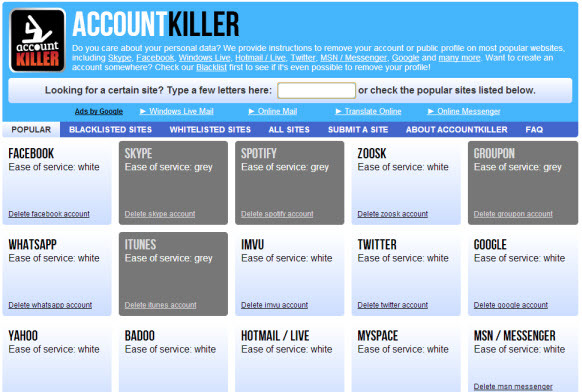 AccountKiller is a website which comes for the rescue of helpless people who are unable to delete / deactivate their online accounts. It helps in deleteing / deactivateing accounts from more than 500 well known websites. Just go to the AccountKiller website, type the website name (from which you want to deactivate / delete your account) or search the website name from the list and follow the Instructions listed over there. It also contains direct links to the main website from where you can easily delete / deactivate your account. That's it, it's so simple to delete your account from many websites.